The HubSpot-Salesforce integration allows you to pass data between HubSpot and Salesforce seamlessly, and maintain consistency between your marketing and sales teams. Please note: if you're setting up Salesforce Selective Sync, your specific settings may vary from the standard requirements, settings, and behavior described below. A HubSpot Marketing Hub, Sales Hub, or Service Hub Professional or Enterprise account. A Salesforce edition with API access, or Salesforce Professional. Be assigned the HubSpot Integration Permission set (in the Available Permission Sets section, select HubSpot Integration Permissions). View Setup and Configuration enabled. Modify All Data on any objects (accounts, campaigns, contacts, leads, or opportunities) which will sync to HubSpot. Have the task Type field be Visible to their user profile. Have the Modify Metadata permission (to view data in the HubSpot Visualforce window on Salesforce lead and/or contact records). Expect to switch back and forth between these instructions and Salesforce for part of the integration setup and installation process. There is a limit to the number of API calls used by the integration per day. A single contact sync can take up to four API calls per record, but this number can vary. 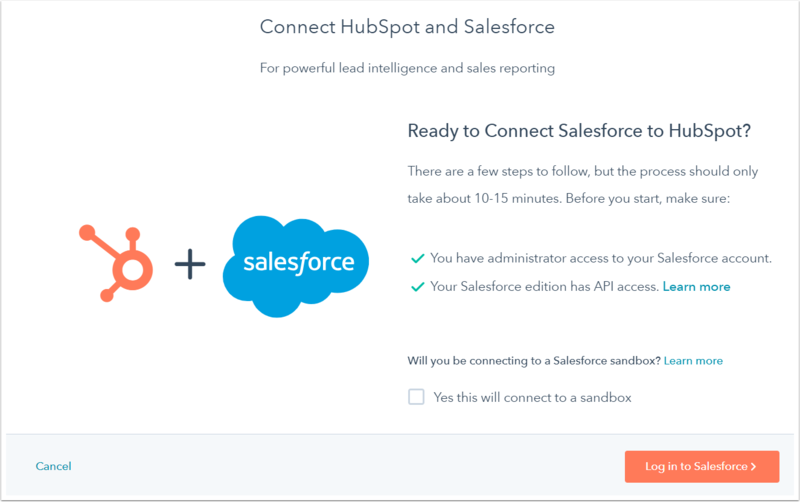 To connect multiple HubSpot accounts to one Salesforce instance, you must set up and install the integration in each HubSpot account. HubSpot will only work with one Salesforce instance. Click the Connect an app button. Use the search bar to locate the Salesforce integration. Hover over Salesforce integration and click View integration. The connector wizard will open. If you're connecting HubSpot to a Salesforce sandbox, select the Yes, this will connect to a sandbox checkbox. Click Log in to Salesforce. In the pop-up window, enter your Salesforce credentials and click Log In. After logging in, you'll be redirected back to the connector wizard in HubSpot. Next, install HubSpot in Salesforce. Click Start the Salesforce package installation to begin. You'll be redirected to Salesforce to install the HubSpot integration package. Select Install for All Users, then click Install. In the dialog box, select the Yes, grant access to these third-party web sites checkbox, then click Continue. Salesforce will then install the HubSpot integration package. This installation may take up to 5-10 minutes. You may see a message "This app is taking a long time to install. You will receive an email after the installation has completed." Click Done and wait for an email from Salesforce with the subject Package HubSpot Integration Install Successful. 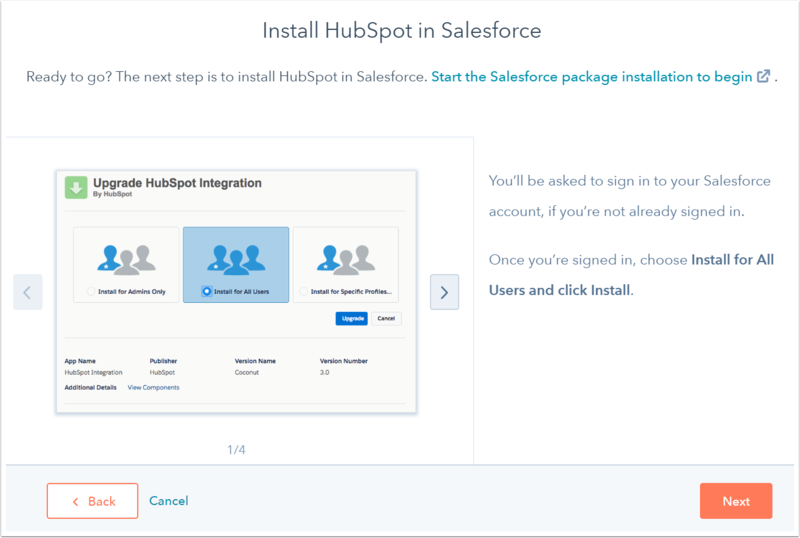 After the package has been installed in Salesforce, navigate back to the HubSpot connector wizard and click Next. Next, add the HubSpot Visualforce module to Salesforce. This module shows the contact's likelihood to close, and allows you to view and filter contact activity and enroll contacts in HubSpot workflows. 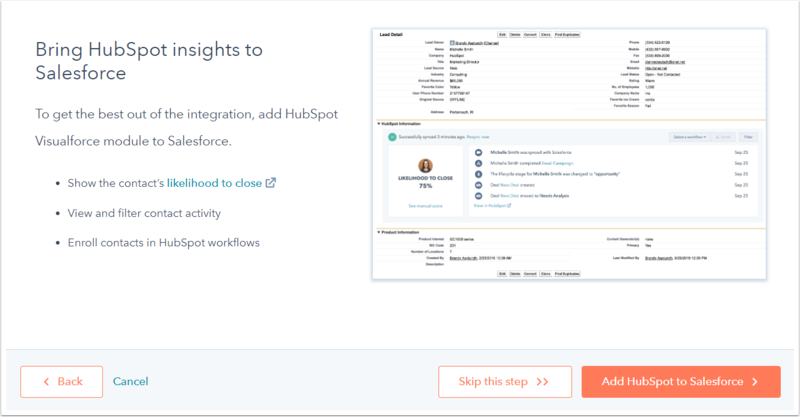 Click Add HubSpot to Salesforce. 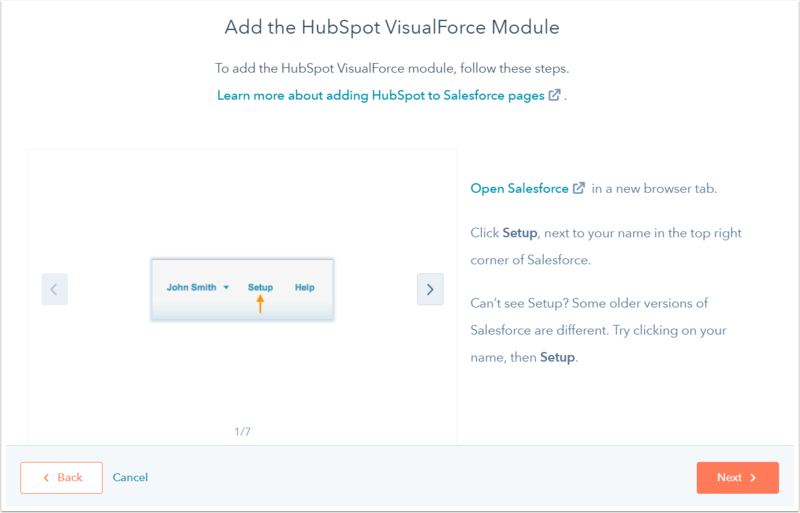 Follow the step-by-step instructions in the connector wizard to add the HubSpot Visualforce module in Salesforce, or learn more about adding the HubSpot Visualforce window to your Salesforce page layouts. 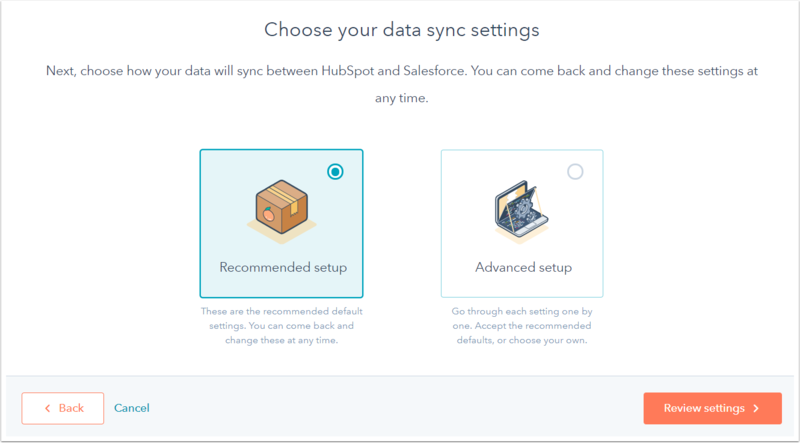 Next, choose how your data will sync between HubSpot and Salesforce. If you select Recommended setup, click Review settings. If you select Advanced setup, click Next. Click the Choose which contacts to sync dropdown menu and select All contacts to sync all contacts to Salesforce, or select a HubSpot list to use as an inclusion list to sync only those contacts to Salesforce. 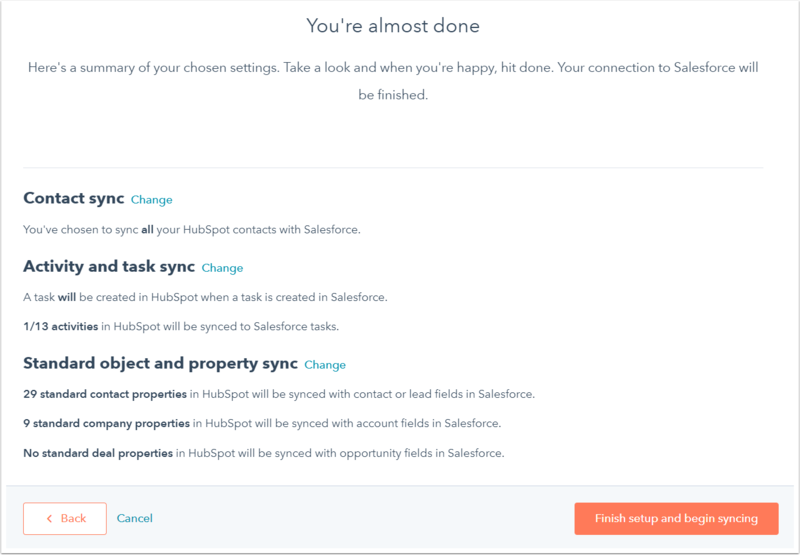 Click to toggle the Salesforce task sync switch on to automatically create a task in HubSpot when a task is created in Salesforce. In the Timeline sync table, select the Sync checkbox next to HubSpot events to sync to Salesforce as tasks, and click the Salesforce task type dropdown menu to select the task type it will be created as in Salesforce. Click the Contacts, Companies, or Deals tab to configure the sync type for standard properties for that object. In the Companies and Deals tabs, you may need to click to toggle the Enable company/deal sync switch on before you can create field mappings. The table displays the standard HubSpot object properties and their Salesforce field equivalents. For each property sync, select the sync type: Prefer Salesforce (default), Always use Salesforce, or Two-way. Learn more about the sync types for Salesforce field mappings. Lastly, review your selected data sync settings. To change the settings for a data sync type, click Change. When you're done, click Finish setup and begin syncing. You'll be redirected to your Salesforce integration settings, and data between HubSpot and Salesforce will begin syncing.